Everyone enjoys the warmth and comfort of a fireplace. However, if you have a child, you may fear starting a fire because it can be dangerous. That being said, you can have a baby proof fireplace so you can enjoy it without putting your child at risk. You’re probably wondering how it’s possible to have the best of both worlds. A baby proof fireplace is relatively easy to achieve. There are a few things you need to do in order to make it safe but there’s no drastic changes that will need to be made. We’ll go over how you can baby proof your fireplace and make it safe to use while having a child. Get ready to enjoy having a fireplace again. The most obvious thing you can do to baby proof your fireplace is to keep your children away from it. Putting a baby gate around the fireplace is the best way to do this. While it might not seem visually appealing to have a tiny gate around your fireplace, you’ll still be able to enjoy it without risking your child’s safety. Be sure to keep the gate at a safe distance from your fireplace. If it’s too close, a spark can hit it and ignite it in flames. However, if it’s too far, it won’t reach both ends and your child will be able to walk around it. The best distance is about 5 feet away from your fireplace. If you don’t feel comfortable with a baby gate, you can install a fireplace glass door. While your child can get much closer to the fire, it’s still behind a glass door that can’t be breached. A fireplace glass door has other benefits than just keeping your baby safe – it keeps your entire home safe. Sparks and smoke won’t be able to enter your home when the door is closed, forcing everything up and out of the chimney. Speaking of chimneys, when you’re not using your fireplace, drafts are able to get into your home through the chimney. If you have a fireplace glass door, you’re able to keep drafts out. Babies and young children shouldn’t be exposed to the cold for a long period of time so being able to regulate your home’s temperature is extremely important. You’re probably wondering, “What does having a clean chimney have to do with a baby proof fireplace?” If your chimney isn’t clean, it can have dire consequences for your child and the rest of your family. 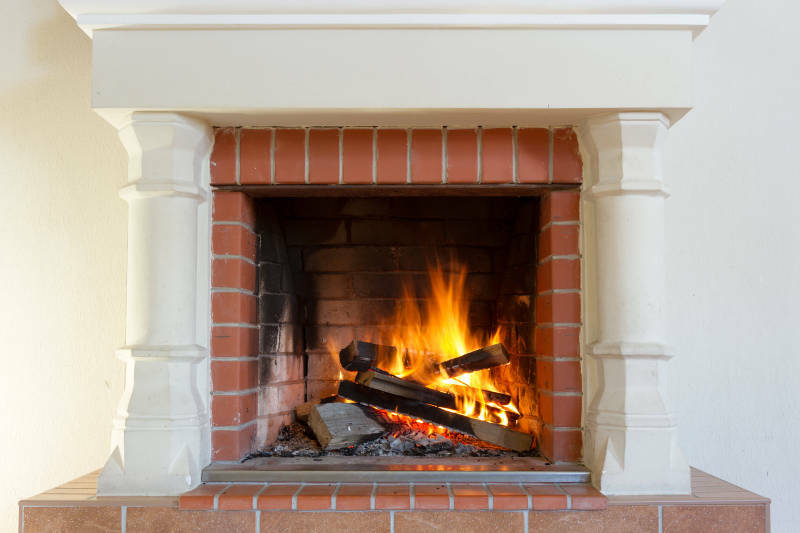 When you use your fireplace, soot and creosote line the walls of your chimney. This creates a blockage that prevents smoke from being able to go up and out of your chimney. With no other place to go, the smoke will billow back into your home which is very dangerous to breathe in – especially for children. You should have your chimney swept at least once every 50 burns or when the soot in your chimney gets to be 8 inches deep. If you’re not sure how many times you’ve used your fireplace or just moved into a new home, it’s best to get a chimney inspection to determine when you need your next chimney sweep. A functioning carbon monoxide detector is a must for any home with a fireplace. This will help prevent your child from having to breathe in carbon monoxide from the fireplace smoke. If too much carbon monoxide is getting into your home from the fireplace, the alarm will go off alerting you that it is unsafe to be in your home. If the alarm goes off, you need to get your family and get out of the home. The hearth sounds like a scary monster and it can be to your children if it’s not properly covered. The hearth of the fireplace is the step in front of the fireplace box. This is usually where you keep knick-knacks or fireplace tools. It’s usually made of concrete or brick and has two corners on each side. We’re sure most parents heard the words concrete, brick and corners and can see where the problems lie with children. To cover up the concrete, there are foam pads that will protect your baby’s head if they were to stumble and fall near the fireplace. Just make sure you remove the foam when you’re ready to use your fireplace because it could catch fire. It’s also important to put foam covers on the corner of your hearth because that can be even more dangerous. Not only are they made of concrete, but they can be sharp enough to cut your baby’s head. You’ll want to prevent that from happening at all costs. Remember how we said many homeowners keep their fireplace tools on the hearth? That’s a bad idea with a baby in the house. The poker can be very sharp and they all might be covered in soot and ashes. You don’t want your baby to get any of that in their mouth. You’ll want to put the tools out of reach of your children. Your best bet is to keep them in a cabinet nearby or on the mantle where they can’t reach. No matter what you do, a young child is going to be curious – especially around fire. The best thing you can do is sit down with your child and explain to them the dangers of fire. The goal isn’t to scare them though. Let them know why you light the fireplace but also let them know what happens if they get to close to the fire. Knowledge is always the key to preventing injuries. Just because you tell your child that a fireplace can be dangerous doesn’t mean you don’t have to keep an eye on them. Children are curious and adventurous. They may want to get a closer look at the fire which can cause problems if you’re not around. Whenever you have a fire going, it’s extremely important to keep an eye on your children and make sure they’re safe. It’s important to make sure you have a baby proof fireplace but it’s not that difficult to achieve. Making small changes and explaining to them the dangers of a fireplace might be enough to keep them safe. Also, always make sure you have an eye on them when you have a fire going. If you need a fireplace glass door or a chimney clean, get a free quote from Early Times. Since 1985, we’ve been making Chicago homes safer and cleaner. We’ll make sure that your children are safe and you’re able to use your fireplace freely.